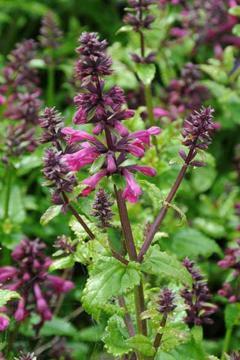 Low growing, clump forming perennial with toothed, slightly glossy, bright green leaves. Faintly aromatic with a fruity smell. Spikes of small tubular purple-maroon flowers, opening from dark buds, throughout summer. Well drained, reasonably fertile to poor soil. Best in full sun but will tolerate part shade..